On Friday 9 November 2018, the President of Umm Al-Qura University, Prof. Abdullah bin Omar Bafail, launched the ‘Our University is Green’ campaign at the Al-`Abdiyyah campus, to be implemented by the Deanship of Student Affairs. The ceremony was attended by the UQU Vice President for Educational Affairs, Prof. Abdul-Aziz bin Rashad Al-Sorouji; the Dean of Students Affairs, Dr. Amro bin Taha Al-Saggaf; the vice deans of student affairs; and members of the student clubs. 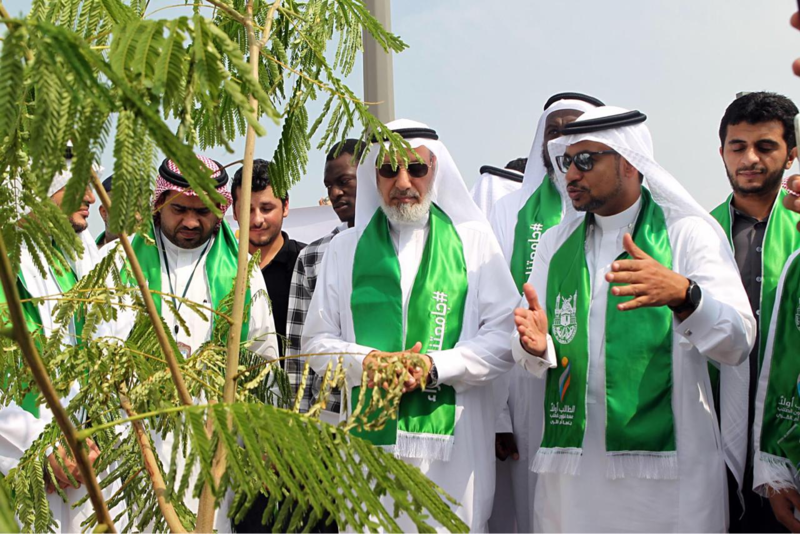 To mark the launching of the campaign, Prof. Bafail planted the first plant with the assistance of several deans and student club members. He stressed the importance of trees and landscaping in the preservation of the environment and the necessity to maintain a green environment inside the university. "This will be the beginning of the greening of our university, Allah willing," he said. He praised the efforts of the deanship of student affairs and their programs that serve the university students. The UQU Vice President for Educational Affairs, Prof. Sorouji, explained that this campaign is part of the annual initiatives and programs carried out by the deanship of student affairs to serve the university students and staff. He added that the ‘Our University is Green’ campaign will encourage the participation of all university students, academic staff, and employees. The Vice Dean of Students Affairs for Counseling, Guidance, and Community Partnership supervisor of the campaign, Dr. Ibrahim Al-Harby, said this campaign is part of the deanship’s initiatives for the greening of the university, in collaboration with the Salem bin Mahfouz Foundation, which supports volunteer programs. He added that the multi-phase campaign will include the participation of student clubs. 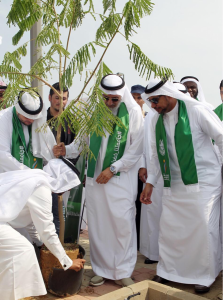 "In the first phase, 700 trees will be planted," he said. He praised the support of Prof. Bafail, Prof. Sorouji, and Dr. Al-Saggaf for supporting the university’s volunteer activities and programs.